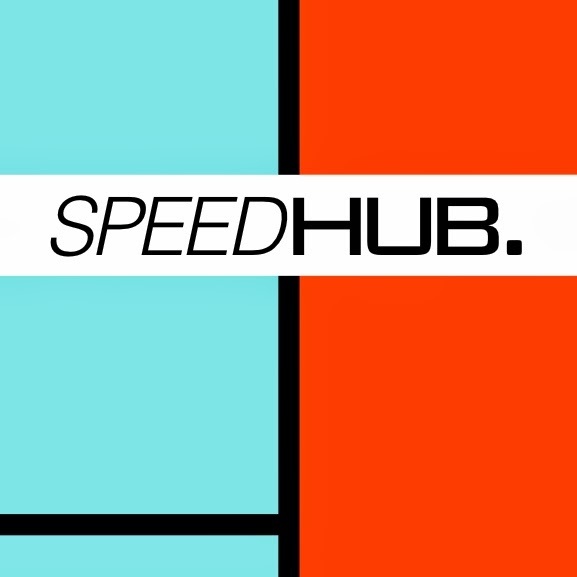 Welcome to my world, a journey into my re-discovery of all things triathlon and multisport. I've been plugging away at mud in Delamere Forest for a good few weeks now and thoroughly enjoying getting down and dirty on a Saturday morning. Since passing my Level 1 coaching I have been taking on some of the swim sessions for Warrington Tri club, the feedback so far seems to be positive. And for additional punishment I have signed up to the Level 2 course starting in Jan. The year will end for me with a race on Boxing Day. The Chester Round the Wall 5 miler, a great way to see out the year I think. So, thank you for reading the blog if you have been following me this year, it's been eventful and I hope that 2015 is successful for us all. 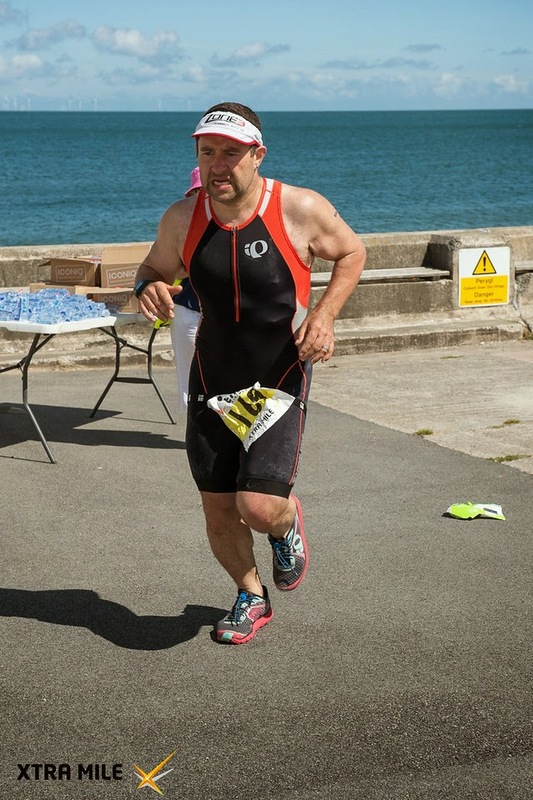 I finished off the tri season with two events, the Sandman Triathlon on Angelsey in September and the 1485 No Frills Sprint Duathlon in October. Both were good events for their own different reasons. Sandman, is a cracking location and we were blessed with good weather, flat calm sea and lumpy but scenic bike course and a lovely off road run to finish (well, lovely apart from that sand dune). The duathlon by contrast was a typical autumn morning, with fog covering the course. I had a very good and amazing bike ride (6th fastest) and only lost a couple of places on the second run, probably one of my better performances all year. So how to sum up 2014. It was my first year under full coaching and overall I believe a great success thanks to the work of Lady Laura Grady and her ever watchful eye keeping me in check and stopping me from doing to much. I felt I could have performed better at the Rubicon Middle, more work to do on making me run quicker off the bike. I started in the world of coaching myself and on the 8th November passed my Level 1 coaching badge with Triathlon England. Circuit classes have started with Warrington Tri, with Carl Loftus giving us a weekly beasting with various strength exercises designed to make us stronger but make us cry at the same time. There is plenty left to do this year, with a few cross country races to do and and race around Chester's walls on Boxing Day. Planning for 2015 is under way (well it has been for a while to be honest and much to Laura's amusement I have events for 2016 in mind already as well). But for now, 2015 will include the Four Villages Half Marathon in Jan, Slateman in May, Outlaw Half in June, a/another middle distance tri in August, Sandman in September and finally Challenge Paguera Mallorca in October. Yes, that is three middle distance tris next year, this could be a disaster, but whatever happens it will be an adventure and one worth being part of. Bring it on. The second of my middle distance races this year and my last A race. I travelled up on Saturday afternoon, about hour 3/4 but thankfully no dramas on the roads for a change. I was on my own for this one as Gail has not been well. This also meant I was more relaxed as I didn't have Jasper to contend with either. Registration was a simple affair so I was able to pitch up the tent and my new folding bed and then have a good look around the transition area and also the run up from the swim exit to T1 (quite a long one as it happened). A dip of the hand in the water and the temperature wasn't too bad, certainly no colder than Pennington has been the last few weeks. I also took a drive through to the village nearby where the 3 bike laps would split so I could get an idea of that part of the course that the organiser was keen to make sure we all understood to save any confusion on race day.There was a catering van on site so dinner was tuna pasta bake whilst I sat and watched a film on the tablet, it was then off to bed. Alarm was set for 5 and I slept through till about 4ish before stirring, but felt like I had slept well. Next stop was the catering van for porridge and a coffee and then had to go and collect the timing chip from registration. I prepared drinks and loaded the transition bag and wandered down to rack the bike. Bike on the rack I then went and checked the swim in/bike out/bike in/run out so I was clear where I was. It was at one end of the racking so easy to find. The racking was very tight on space and it was a common comment I could hear all around from many competitors, but fortunately I don't have a lot of gear. Bike was popped into a high gear and shoes and lacky bands readied for flying bike mount. We had a briefing with all the usual standard stuff, then we had a 15 minute walk down to the swim start further up the river. 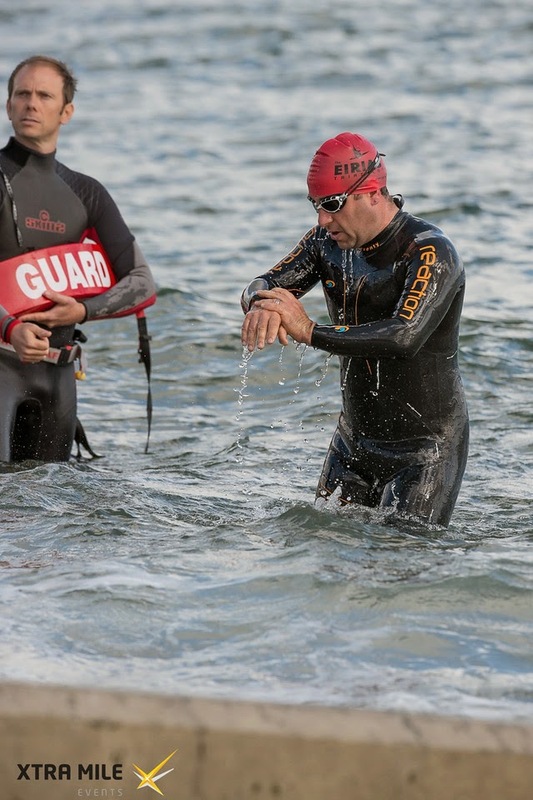 I got in the water quickly and kept moving, it was ok temperature wise, but it did take a long time for all athletes to get in the water which was a pain, and due to the flow those of us at the front kept drifting. I seeded myself slap bang in the middle of the river for best flow and on the front line. Eventually we got set off and it was into the 10 hard strokes before breathing, a few more hard strokes and then settled into a steady pace. I tried to draft as much as possible, but found it hard to drop on a pair of feet that didn't then disappear due to questionable navigational skills. Probably about half way through the swim I took a kick to the goggles by one of the drifting swimmers, but aside from me turning the air blue with some inappropriate language the goggles stayed on and I settled back in with only a small amount of water in the left lens. You actually pass the finish on this swim and continue downstream before turning and heading back up 200m against the flow. Turn at the buoy was fine and I stayed towards the bank as much as possible to mitigate the flow. It was a deep water exit onto a wooden platform, though there were helpers and I was out with no issues. It was then a ~400m run to T1, it was sligtly uphill and towards Newby Hall itself through the gardens before turning off through the bushes. I could see a girl in front of me struggling to find her wetsuit cord, so caught up with her and pulled it down (she was grateful). Thankfully they have carpeted the route as one of the paths we ran on was pea gravel. Into T1 and wetsuit off, helmet on and then ran out with the bike to the mount line. Flying mount went a little wayward and nearly drifted into a guy next to me, but got it back under control and then I was off, eventually getting feet into shoes with no problems once I was rolling. I was carrying 4 gels (one in reserve) and the bottle mounted in between the tri bars. The course was a 2 big loops of 40k and 1 small loop of 7k. Initially it was through country lanes before a small climb through Kirby Hill and then out onto the A roads. These were fast flowing wide A roads with good surface and it was easy to get down on the bars. The first loop went without incident and I was passed but also passed plenty of people myself, keeping it in zone 3 and sipping from the bottle (Hi 5 energy). 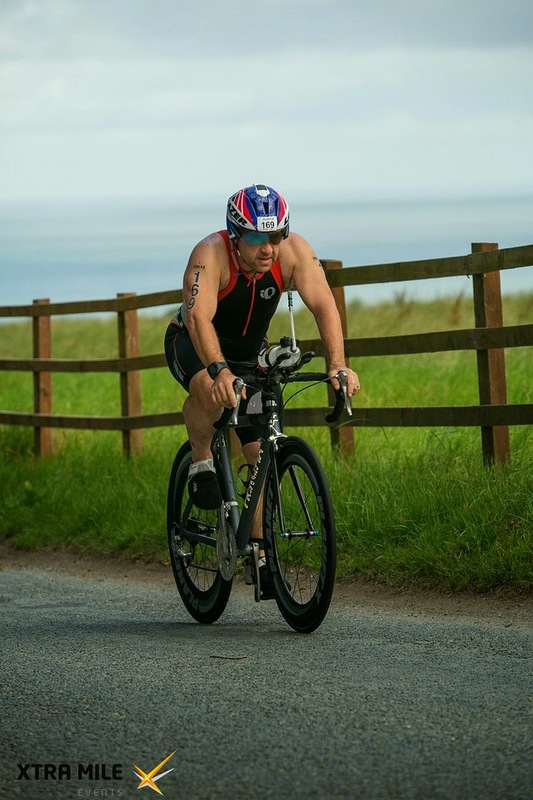 The bike course loops back through Newby Hall and it is there they have the bike aid station. I grabbed a bottle of energy drink and as I road back out of the Hall ground I topped up my main bottle. Somewhere along the way into Lap 2 for some unknown reason the arm rest of the clip on tri-bars sheared off (too much power being applied I guess (lol)). As such all I had to balance my arm on was the two bolts that hold the arm rest in place. This was extremely uncomfortable for the remainder of the bike and in the end I was balancing my left elbow on the pad and crossing my hand over to rest on top of my other hand. Lap 2 also saw an increase in the wind speed and the once fast flowing sections became in some cases a bit of a battle of wills against the headwinds. Once back into the lanes it was a little more sheltered and it was then through the Hall for the end of Lap 2. I ignored the feed station as there was only a 7k lap to do and this was quickly despatched. My flying dismount on the other hand was less than successful, and couldn't lever my leg round for some reason, so just came to a halt and stepped off the bike. The run into T2 felt fine, no obvious issues. Bike racked, helmet off and I sat down to don socks and shoes, grabbed my cap and away I went. There was some water on the way out which I grabbed a cup for cooling me off rather than drinking and settled into zone 2 as instructed. The run is 4 loops all passing through Newby Hall and of 5k in length. the run starts flat and then there is a small dip and rise up to the first kilometre marker. It was as I approached the top of the rise and the 1k board that I started to feel a cramping sensation in my left quad. This was odd and not something I had experienced in racing before. I stopped briefly, crouched down with my feet under me to stretch it out. I stood and started off again and this seemed to have worked. There was a slight twinge as I neared km2 but it didn't flair up as it had before and was fine for the remainder of the run. What did become apparent during the 1st lap was that increasing the pace was almost going to be a non starter. Even level 2 felt like a hard slog and I began to wonder if I would even be capable of finishing the event. Eventually I reached the aid station back at Newby Hall and took a bottle of water for cooling purposes along with a gel. I walked through the aid station and out the other side I drifted into a run, but the required lift to level 3 just wasn't happening, I just didn't feel that there was anything there to give beyond where I was at. The km's ticked by slowly and I occasionally took a short walking break and slowly I at least started to feel a little more alive, but the pace remained the same. At the aid station for the second time I took on some coke, gel and water for cooling and proceeded to lap 3. The heat on the run had been quite hard and the car temperature gauge later had shown 25 degrees. Around 3k into lap 3 I started to get some camps in the stomach, nothing severe and certainly manageable. I guessed at either the gel or coke causing this. Reaching the aid station at the end of Lap 3 I knew it was 1 lap of 5k left and no matter what I was finishing this. I took on 2 cups of coke and again some water for cooling and then set about the last lap, also determined that I would not walk any of the last lap. I was ever hopeful that I would feel like I had enough to up the pace, but it just never came and whilst the last 400m might have been a bit more energetic as far as I can tell, the whole run was done in level 2. I was a bit of a mess across the line and it took a good hour and half before I started to feel normal again. 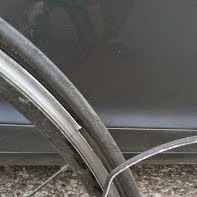 This is a pic of my rear wheel after a rather interesting set of intervals on the road. Fortunately I was most of the way through the fourth and last interval when then was a sudden bang and the back of the bike began wobbling rather precariously. The bang indicated a sudden blow out, the cause was somewhat surprising, a long strip of the rim had broken away completely. Saturday afternoon was my second and final time trial of the year om the J2/1 course near Macclesfield. It's a simple course with a couple of roundabouts to negotiate, but not necessarily the quickest either. I did plenty of warm up and then lined up ready. It was basically a hard effort for the whole thing, though the head wind on the way out didn't make it the easiest of rides either. By the time if crossed the finish line, my lungs were ready to burst through my chest and the quads were burning, so I was certainly glad it was over. Finishing time was 25:49, so whilst not the slowest there is definitely room for improvement and I will be looking to do a few more TT's next year as part of the build up for my events. This coming weekend on the 31st will be my second middle distance race of the year and since my comeback. I think I am ready, I'm not putting any expectations on myself other than to finish as well as I can. It will also represent 2 years since I started back in triathlon so keep an eye on the blog for my race report and review of the last 2 years. I'll start by saying that this is a good, well run event and sadly was impacted in numbers due to the Championship race at Liverpool that was on the day after. My weekend started with a ridiculous 4 hour drive to get to our caravan in Prestatyn. A lorry had downed some power cables across a dual carriageway just off the M56 and the subsequent diversion was a bloody nightmare. I had intended to register the night before and go for a bus tour of the bike route, but was that tired and stressed from the drive I knocked that on the head and just relaxed. So it was an early start on Saturday morning, but there was little stress on arrival as registration was quick and easy housed in the Eiris watersports centre. I should state that in the Standard + (the + being a longer than normal bike course) had only 30 entrants and by the end several had dropped out so it was a small field. The Middle Distance had about 85 entries. check of data I had the swim as 1800m on the Garmin so there is a good chance that it was long. Through to T1 and I was moving quickly, sadly I made an error that even now I am somewhat dumbfounded by. It wasn't a case of not doing the helmet up before I removed the bike. I didn't actually put the helmet at all!!!! Being stopped at the exit of transition it didn't even register at first that I hadn't got a helmet on. I can only surmise that because it had been knocked off my handlebars and was on the floor along with other peoples gear that I hadn't seen it. So it was that I had to run back to get it and then set off properly. Over the mount line I was doing the flying start again and it went well. I exited the car park before thinking about putting my feet in the shoes properly. The first 10k of the course basically climbs it's way up and whilst not steep is a good slog. I'd passed a couple of guys early on and then sat in and span my way as best I could up the climb. Once to the top of the ridge the course evened out and it was a nice ride across the ridge line before dropping nicely down into the valley below for a nice fast section of riding. Again a nice quick transition and a sprightly jump off a set of steps onto the promenade and the run course I was feeling bouyant. 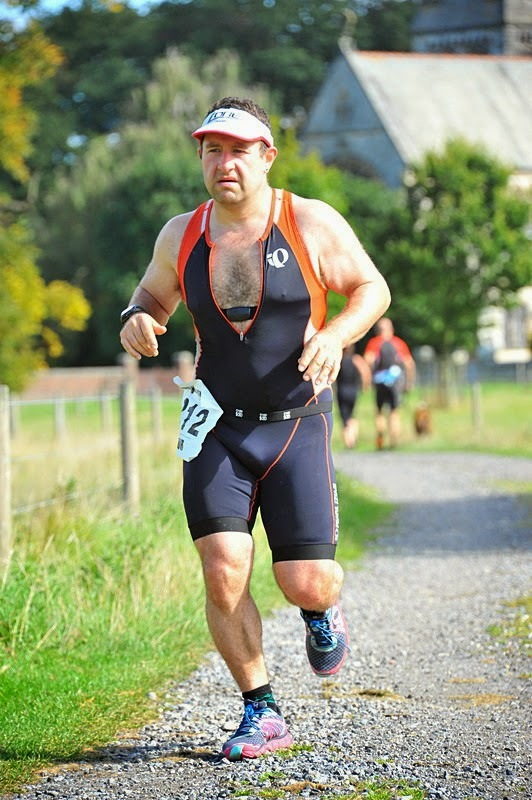 It's fair to say that at this stage I had no idea where I was with regard to the others in the race so as I trundled down the run course it was around 2.5k in that the 1st place triathlete passed me on his way to the finish, I clapped him past in recognition of his efforts. The heat of the day was building but I kept slogging away, becoming more bemused why no one else was in sight behind 1st place. It was some time before 2nd and 3rd appeared and it also at this point became apparent to me that I was actually a reasonable way up the field. It was inevitable that I would be passed on the run at some point and indeed not far out from the turnaround point I was passed by a guy I had taken on the bike. What I subsequently worked out was that as he came passed following the turnaround was that I was in 6th place!!! Could I possibly hold onto my place? It was 5k back the heat was up, there was a head wind and a couple of small climbs to negotiate. The heart rate was gradually climbing as the average pace went down and the last 1k was a hard effort. I think the pic shows how hard I had been working and I was across the line in 53:08 and a final time of 3:15:20. It was a great event and I will highly recommend it to anyone. Next year they intend to move the date to September to try and boost numbers and all being well there is a good chance I will be back. The most disappointing thing....................I won my age group and wasn't there to claim my prize. It never occurred to me that I would have won a prize. What a doughnut. 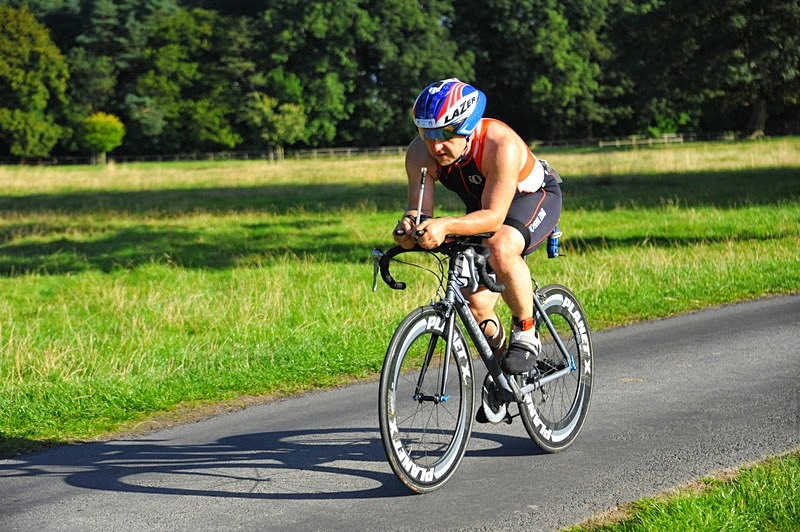 Next up is a 10M TT and then the Rubicon Middle Distance at the end of August (in what will be 2 years since I started back on my triathlon journey).